An Ann Arbor, MI-based augmented reality startup born out of Startup Weekend Detroit, which made a splash at last year’s CES, spent most of 2015 settling in and preparing for the next phase of growth. Now SpellBound, formerly known as MagicBook, is getting ready for the public release of its mobile app—which turns children’s books into virtual, interactive, 3D pop-up experiences—and is running an Indiegogo campaign to help raise awareness of the app and simultaneously donate books to C.S. Mott Children’s Hospital in Ann Arbor. 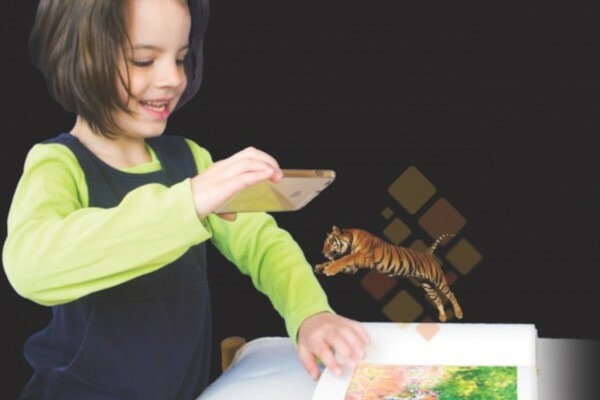 SpellBound readers can use their phones or tablets as viewfinders to scan a book’s pages, activating interactive layers on the device that include sound and 3D images. Most other products in this space require special books that have codes or other technologies that tell the phone what to do. SpellBound works by recognizing an image or specific text instead. After CES, SpellBound’s founders, Christina York and Marjorie Knepp, launched an intensive customer discovery process and raised enough money from friends and family to finish building iOS and Android versions of the app before running it through a closed beta test. York said she and Knepp had an “a-ha moment” when they were talking to a parent and potential SpellBound customer about how she uses technology in her home. It turned out this particular parent was a therapist at Mott Children’s Hospital, and she helped the SpellBound creators understand the soothing power of technology in a children’s hospital, where it’s often used to help kids deal with the trauma associated with illness and prolonged hospitalization. Their conversation unearthed a new use case for the app. Although this is SpellBound’s first attempt at a crowdfunding campaign, York would like to do another, she said, if “this model proves successful, maybe for schools without tablets or devices.” Education was not a market SpellBound had initially planned to go after because the company thought it would be a long, cumbersome process involving a lot of relationship-building. SpellBound now has a number of school pilots running, including one in Texas with educators that teach their colleagues how to add more technology to their lesson plans. After the app is released publicly, SpellBound has four or five more books it’s getting app-ready after Sleep Sweet. (The charmingly titled Albert the Confused Manatee will likely be the second SpellBound book.) York said the company plans to pursue seed funding soon. York and Knepp are the only full-time employees for now, but SpellBound has a number of part-time developers and animators on staff. York said so far, building a startup in Michigan has gone better than she or Knepp expected.